Suspension springs are sometimes called suspension coil springs or coil-overs. The springs play an important role in ensuring you have a smooth and comfortable ride. Therefore, they take up all the stress and tension from a bump and make sure you don’t feel anything. Suspension springs are made up of industrial grade steel, as they share the car’s weight with the struts. Springs are extremely durable but anything can happen with mechanical equipment. The spring can snap in two or simply wear out due to excessive usage. Usually, if one of the springs gets compromised you are required to replace the one on the other side as well, since adding a new spring can affect ride height. If you don’t replace one with the other, your vehicle will look unstable and unbalanced. Suspension springs require precision and proper tools to repair or replace so it is not usually a job for a home mechanic (unless you have tools and knowledge). Therefore, a mechanic should be your first choice when you feel something is wrong with your suspension. Take a look at the symptoms below to know exactly when to go to the mechanic for a checkup. The suspension springs act as a cushion between the shocks and the struts. The spring ensures the struts do not feel the entire force of a bump. 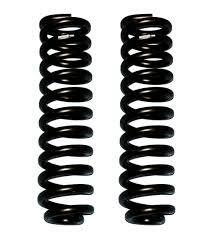 Therefore, if the spring breaks or wears out too much, you will feel a lot of bumps on your ride. Be very cautious, as a broken spring can directly damage your struts and cause you an even bigger headache. The best way to test this is to take your vehicle on a familiar road and test it on speed bumps and potholes, if you are experiencing more bounce than usual, it is time to visit the mechanic. The reason behind changing both the suspension springs when one goes bad is that if you don’t change both your car will tilt to one side. If your car is higher on one side and lowers on the other, you might have a broken spring. Take your vehicle to the mechanic as soon as this mishap happens. The suspension springs further absorb the force felt by the shock absorber. In other words, the shocks have a limit to the amount of force they can absorb, the rest is transferred upwards to the spring. It is the spring’s job to become the last cushion for the struts. If the springs fail and/or the shocks go bad, the struts can break from brute force. So, whenever you are feeling the unnecessary bounce in your car after exiting a bump, schedule an appointment with a certified mechanic. Any harm to the suspension will mean, your wheel alignment is being compromised. And when the wheels are not aligned properly, the tires take all the damage. That’s why you should regularly check your tires for any wear and tear. If anything is out of the ordinary like uneven tread depth or irregular wear and tear, your suspension is probably going bad and needs a mechanic. When the suspension spring goes awry, the tires have a difficult time staying on the road. After every bump, they might bounce up and fail to come back to their original position. In this case, your car might fall down hard and many important components may get damaged. First and foremost, the struts will feel the damage than the underbody and then other vital engine parts. Not to mention your own head will start spinning. Hence, to avoid further damage to your vehicle, you should visit the mechanic at the earliest. A part made of steel cannot be repaired at home. You definitely need the help of a certified mechanic with the right tools to help you out of this mess. Driving with care and try to stray from speed bumps and potholes, particularly at high speeds. This way you will ensure your car’s suspension and other parts stay in place and have a long life. Otherwise, one big bump and whatever is not broken yet will be a break. While this is not the best solution, it can help you stay away from the mechanic until you save money for an actual solution and that is the replacement of a suspension spring. Make sure you choose the right model for your car. The springs can differ between car models also, depending on if you have a sports chassis or not. The only solution for a bad suspension spring is either to replace it or repair it, both of which are pretty hard to do yourself. So, you most likely have to visit the mechanic and spend money. The sooner you go to the mechanic after you see any of the above signs, the fewer money you will spend. Stalling a visit to the mechanic will only create more problems for you in the future. Suspension coils are made of steel, so you can imagine they will not exactly be very cheap. In fact, new suspension springs can cost you a fortune. Of course, the make and model of your vehicle is the defining factor when it comes to price, but even then, buying a coil spring will not go easy on your pockets. So, the first thing you should do is look for repairs. However, repairs are only possible if your coil spring is intact and is just worn out. That’s understood, it can happen, it is a mechanical object and just like any other mechanical part, a bit of service will solve any issues. However, if it comes to the point when you have to replace the whole suspension coil, you are looking at $100 to $400 in repairs. This price also depends on the availability of the part. For instance, the coil over of a Porsche will cost you more than a spring of a Dodge. But wait, the fortune you will be spending does not include the labor costs incurred. For that, you have to pay an extra $100 to $200.